For almost twenty years, Christian Cinema has been on a mission to provide the widest variety of Christian films to families of faith. In that time, we transitioned through formats, starting with VHS in 1999 to DVD, and then to digital in 2013, when we began building out what would become the DVD replacement solution for our market. Today, Christian Cinema is the industry leader in Digital Transactional Video on Demand which enables consumers to buy and rent movies. 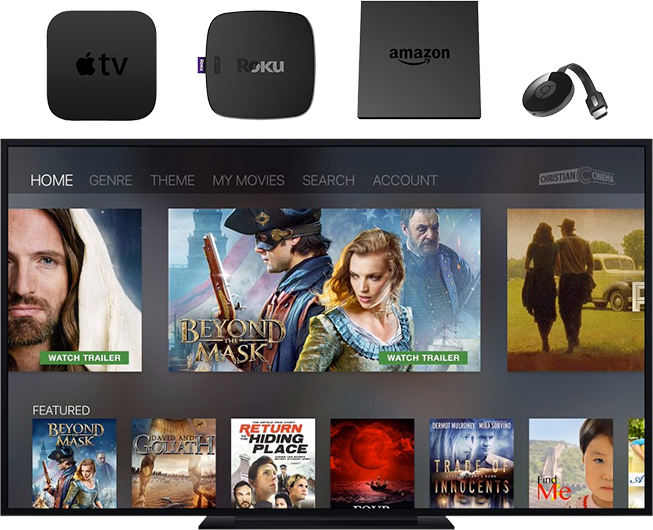 Christian Cinema’s world-class digital platform is integrated across seven major platforms: Apple TV, iOS, Android, Roku, Chromecast, Amazon Fire TV, and Fire Tablets. Christian Cinema powers digital movies for the largest Christian retailer on the planet, Christianbook.com, and we are working with other, yet to be announced, Christian retailers on their integration so that they can continue to support and carry Christian movies. The digital format is the path ahead for purchasing high resolution filmed content and makes the most sense for consumers, suppliers, and retailers. In light of the format shift to digital and its growth, Christian Cinema has reached a decision point once again, but this time with the DVD format which has served us well for two decades. Starting August 1, 2017, Christian Cinema will transition to digital only, which means the DVD format will be discontinued along with any accompanying physical goods. Christian Cinema will continue to grow and support feature films, documentaries, short films, and educational programs through the digital platform. As a group, Christians are watching more content than ever before. Christian Cinema’s aim has always been to provide a one-stop shop for consumers with a place to buy Christian and family movies through a robust platform which enables our filmmaker partners to reach their intended audience. Our mission has not changed, and the future is bright! You will find the selection and access to movies from Christian Cinema on digital to be ideal for you and your family at home or when you travel. Enjoy the benefits of owning and renting movies on digital; take them with you wherever you go, watch anytime, anywhere on nearly any device and at the highest viewing quality available. In fact, we want you to try it for free. Start building your Christian movie library. Go to https://www.christiancinema.com/pick-1-of-12 for more information and to get a code for your free movie.